Peter Shaffer’s acclaimed play makes a fascinating (if verbose) movie. Richard Burton is Dr. Dysart, a children’s psychiatrist assigned to treat stable boy Alan Strang (Peter Firth), who has blinded six horses. As Dysart searches for clues to the boy’s dreams and behavior, the film takes on the structure of a psychological/philosophical (and sometimes theological) detective story. There’s a wild card in the premise: Dysart finds himself torn between wanting to cure Alan and admiring his passion — which the dry-ice Dysart definitely lacks. Shaffer sets the stage for a classic conflict between cool, civilized stability and fierce, chaotic primitivism. 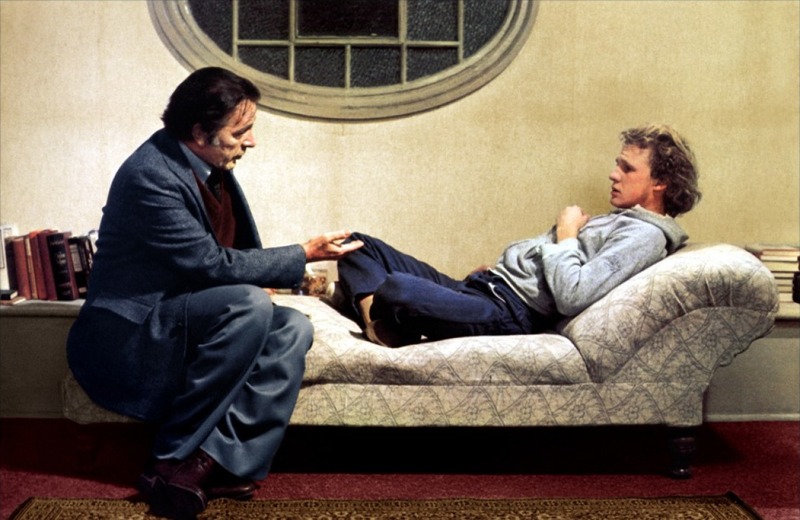 Director Sidney Lumet provides eligiac images whenever he can, to suggest Alan’s beautiful, frightening inner life; Dysart has to make do with words to express his own deteriorating inner life. Maybe that’s part of the point, but in a movie, we’re acutely aware of monologues as monologues; Dysart shouts at us one time too many, when Lumet could’ve found more visual ways to establish Dysart’s stagnation (there’s a neat scene in which Dysart, sitting in his boringly immaculate living room, pores over reproductions of ferocious horse-gods in battle). Still, an eminently worthwhile film, with two showboat performances by Burton and Firth. I could have done without the horse-blinding flashback, though. Ralph Bakshi’s first whack at feature-length animated fantasy is preferable to his later Lord of the Rings, if only because it’s about an hour shorter. It also has moments of ragged Bakshi-style humor, mostly involving the wizened, tough-talking good wizard or the bumbling forces of evil. But this is pretty much straight comic-book stuff with occasional pretensions to satire. 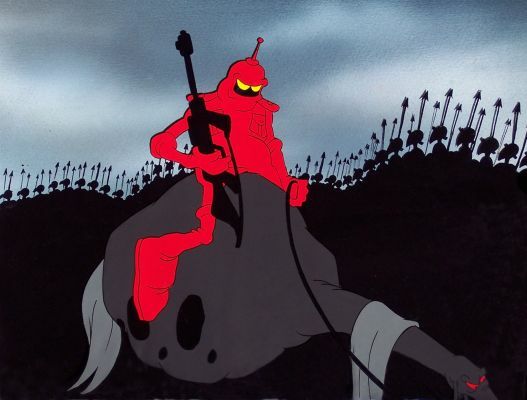 It’s not enough that the villains are obvious Nazi surrogates; Bakshi also has the evil wizard use footage of Hitler’s armies as a weapon against the good warriors. It’s possible that a cartoon primarily aimed at kids might find some legitimate use for such footage, but Wizards doesn’t exactly make a case for itself. Eventually, the film degenerates into sub-Heavy Metal carnage, with hordes of ogres and goblins wielding semi-automatics and riding tanks. Movies like this make you wonder why fantasy and science fiction have a following. It doesn’t help that much of Bakshi’s character design is ripped off from the work of Vaughn Bodé. This was Bakshi’s first movie for kids, and it feels like one in the worst way. Well, here’s a toxic little item. 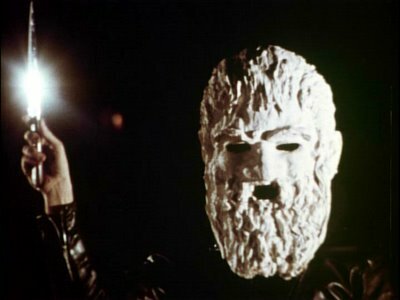 A sleazy criminal and pornographer (writer-director Roger Watkins) and his group of Manson Family-type followers kidnap some acquaintances to serve as the subjects of a conceptual snuff film. Doesn’t sound like such great shakes, but this movie has gained substantial notoriety for a reason, mainly the intensity of its tone and the simplicity of its goal (to appall you). I hesitate to rank it with Texas Chainsaw Massacre and Last House on the Left (one of the movie’s later distributors slapped the “Last House” title on it; Watkins’ preferred title was The Cuckoo Clocks of Hell), and I really wouldn’t, but it has some of the same grimy atmosphere — the sweat and stink of a bunch of crazy people making balls-out horror for no money. Watkins has said he was flying on crystal meth during much of the shooting, and it shows. For years, fans had to make do with cut versions or ninth-generation bootlegs; Barrel Entertainment’s DVD (now out of print) restores the infamous disembowelling scene and the bit where a man is forced to fellate a deer hoof (um, yeah), and though the package claims that the transfer has “optimal image quality,” it still looks scratchy and crappy. Which is sort of how a movie like this should look. You probably needed to see this at the right place and time to consider it any kind of masterwork (it has its devout fans), but it has a grubby integrity. It was finished in 1973 but didn’t get much of any exposure until the late ’70s, when it started making the film-festival rounds and building word of mouth. Watkins, who had an intriguing screen presence and came across on the DVD extras as a smart and caustically amusing fellow, died on March 6, 2007.